After a very sad total disaster of a press conference delivered to us by none other than America's President Elect, you may be looking for ways to not fall into despair's waiting maw. 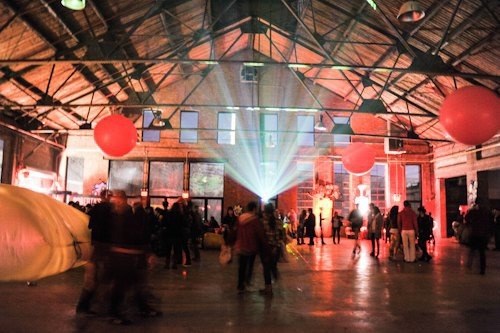 Thankfully, Knockdown Center is coming to the rescue this weekend with four days of action, art, and music. The festivities for "Stay Nasty" kick off tomorrow with a free opening reception for the Nasty Women exhibit at 7 p.m. and music by DJ Belinda Becker, Lauren Flax, Antwan Duncan, and Flex Lang starting at 9 p.m.
Don't worry, though, the plan is not only to dance until you forget. Saturday promises to give everyone a chance to get involved with a free information fair featuring local organizations which will certainly need your help and a panel on activism and the movements that will inevitably shape the national conversation in the next four years and beyond. After a day of thinking, organizing, and planning, you should stay for a packed evening of music and comedy starting at 8 p.m. Proceeds from all non-free portions of the weekend will benefit a number of non-profit organizations including the Callen-Lorde Community Health Center, Girls for Gender Equity, The New York Immigration Coalition, and SisterSong. Knockdown Center has organized the events around the Nasty Women art exhibition which will be on display throughout the weekend. Their aim is "to demonstrate solidarity among artists who identify with being a Nasty Woman in the face of recent and ongoing threats to women’s rights. NASTY WOMEN aims to act as a catalyst for conversation, organization, and action preceding the Presidential Inauguration." Getting involved is easier than ever, Bushwick! Featured image: Interior of Knockdown Center by Maria Gotay for Bushwick Daily.